LAKE FOREST, Ill. (AP) For Jimmy Garoppolo, the wait is over. It’s time to show he is ready to be a franchise quarterback, and that begins against his hometown team. 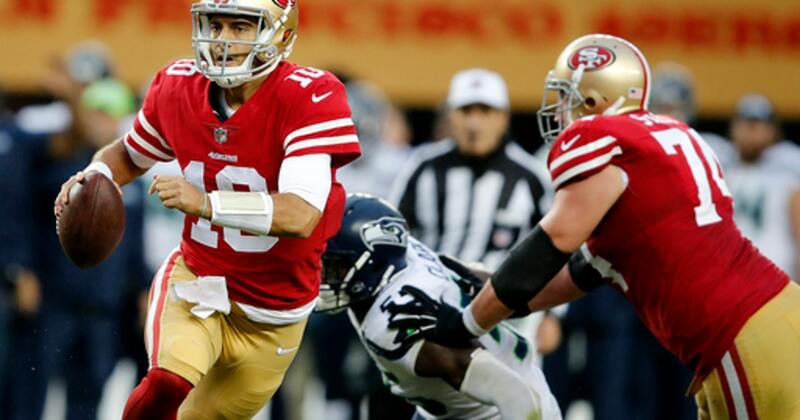 Garoppolo makes his first start for San Francisco when the 49ers visit the Chicago Bears on Sunday in a game that matches struggling franchises. Garoppolo grew up a Bears fan in suburban Arlington Heights and played at Eastern Illinois. He had Brian Urlacher and Anthony Thomas jerseys as a youngster. But when he arrives at Soldier Field on Sunday, it will be his first time there for a Bears game. He’ll have quite a vantage point as the 49ers (1-10) try to pick up a rare win and hand the Bears (3-8) their fifth straight loss. He’ll have quite an opportunity, too. Acquired from New England for a second-round draft pick in late October, Garoppolo finally gets his chance to be a starter after backing up Tom Brady for 3 1/2 years. He made a cameo at the end of last week’s loss to Seattle and looked good. Garoppolo replaced the injured C.J. Beathard (knee, hip) with just over a minute left and completed both passes. That included a 10-yard touchdown on the run through a tight opening to Louis Murphy on the final play. Garoppolo started two games for New England in 2016 when Brady was suspended, and his impressive showing made him a highly sought quarterback. He threw for 496 yards, four touchdowns and no interceptions in wins over Arizona and Miami. Though he has an expiring contract, the 49ers clearly view Garoppolo as a potential franchise quarterback . Ironically, they could have taken the QB they will be seeing Sunday with the No. 2 overall pick in this year’s draft. Instead, Bears GM Ryan Pace traded up a spot with San Francisco to grab Mitchell Trubisky. The rookie has shown a strong arm and quickness at times in his seven starts. But he has struggled with his accuracy and posted a career-low 38.3 passer rating in last week’s blowout at NFL-leading Philadelphia. PROTECTING GAROPPOLO: One reason the 49ers were hesitant to turn things over to Garoppolo was because of a patchwork offensive line that has been dealing with injuries to tackles Joe Staley and Trent Brown. The two have both been healthy for just one game since Garoppolo arrived, and Brown’s status this week is uncertain because of a shoulder injury. Beathard was sacked 17 times in his five starts. GOOD AS GOULD: This game will be a homecoming for Niners kicker Robbie Gould, who spent 11 seasons with the Bears. Gould was part of Chicago’s 2006 Super Bowl team and holds the franchise records for points scored (1,207), field goals (276), and field goals of at least 50 yards (23). He played against the Bears as a member of the New York Giants in 2016. But this will be his first appearance at Soldier Field since Chicago released him prior to last season. GROUND GAINS: The Bears were held to 6 yards rushing last week, the second-lowest total in franchise history. But there could be room to run facing a defense that ranks 30th against the rush. That should come as good news to Jordan Howard. The NFL’s fourth-leading rusher, he managed a career-low 6 yards on seven attempts against the Eagles. TOUTING THOMAS: The Niners were happy to move down a spot in the draft-night deal with Chicago because they had targeted DL Solomon Thomas as the player they wanted with their top pick. Thomas hasn’t quite performed up to the standards of a No. 3 overall pick. He has two sacks and has generated pressure on the quarterback on less than 5 percent of his pass rush chances, according to SportRadar. HEATING UP: Coach John Fox once again insisted this week he’s not thinking about his future in Chicago . But at 12-31 in three seasons with the Bears, the heat would only intensify with a loss this week.